Click here to view all publicly available reports and deliverables. on the 25th October 2011, representatives of the coordinator and the work package leaders visited the Project Officer, Mr Joost de Bock, at the DG RTD building in Brussels. An overview of the project was given, focussing on the outcomes achieved, and the opportunities for exploitation. The final AZIPILOT project meeting was hosted by South Tyneside College at their facilities in South Shields, UK. A report on the progress and outcomes of the AZIPILOT Project has appeared in Fairplay Solutions Issue 176 (June 2011). A pdf of the article in question is available here (copyright Fariplay Solutions). The penultimate AZIPILOT project meeting was hosted by UKMPA on the HQS Wellington on London's Embankment, where umbrella organisation IMPA (International Maritime Pilots Association) have their offices. With less than two months remaining until the Project finishes, the consortium focussed on planning for the final meeting and project results showcase, and finalising the input of all technical reports due to be published in the next two months. As the project enters its final six month phase, the partners met at the premises of Cons.A.R member Confitarma in Rome on the 31st May and 1st June 2011. The meeting focussed on efforts to ensure the highest possible quality and exploitation of AZIPILOT's results, the partners also took the opportunity to continue the excellent engagement activities of the workshop by engaging in an informative round table question and answer session with Captain Vincenzo Ruocco, an Italian Pilot who was unable to attend the Workshop event in February. DST hosted a meeting on the 3rd and 4th November 2010 at their headquarters in Duisberg, Germany. Partners had the opportunity to view the test facilities on site, as well as simulator facilities located on a College campus nearby, jointly operated by DST and the College. The meeting focused on planning the upcoming stakeholder workshop and conference, and ensuring all Deliverables for Milestone 2 (M27) were on track. UKMPA decided that their lack of a headquarters at which to host a project meeting left them with an exciting option: to host the M21 meeting aboard the pod-driven ‘Independence of the Seas’, on a short cruise out of Southampton to Cork and back at the end of August. Project partner Gareth Rees piloted the ship out of Southampton with all project partners on the bridge to witness the manoeuvre firsthand. Having made use of the ship’s conference facilities during the sea days, partners were also on the bridge for the entrance to Cobh and extremely tight turn for the berth: a dredged box 400 metres across provided a challenging restricted space to swing the ship which showed off the capability of the Pilot, Captain, the bridge team and of course the ship and its array of modern equipment. No tugs were necessary. In Cork, a visit to the National Maritime College of Ireland’s (Coláiste Náisúnta Mara na hÉireann) Simulator was arranged, where the degree of planning that Cork Pilots had done prior to this ship (the largest to use this port and berth) arriving for the first time a year earlier was apparent. At sea, on the return leg we continued our partner meeting in one of the Conference facilities on board and were privileged that Captain Teo and his Staff Captain answered many questions posed by the group which was followed by another bridge visit where the Captain Teo then explained how he operated the bridge controls. This was followed by the Chief Engineer escorting the group to the ER Control Room, a visit to the Port Pod Room and answering the many questions that the group had. A visit to the Manned Model Lake at Marchwood was also arranged upon return to Southampton. The halfway point of the AZIPILOT project has been reached, and was marked with a meeting at Port Revel near Grenoble in France in May 2010. This milestone meant the official end of Phase 1 of the project (the Review Phase), overall the project has been making excellent progress towards its aims, and the Steering Committee did not hesitate to approve the continuance of the work. The consortium were given the opportunity during the meetings to experience firsthand the manned model training carried out at Port Revel and to have a go at helming a pod-driven ship around several scale features such as locks and ports. The first meeting in year 2 of the AZIPILOT project was held at METTLE's offices in Sophia-Antipolis, Southern France in February 2010. The consortium focused much discussion on the completion of Phase One deliverables by the M18 deadline, as well as sharing technical insight across the four disciplines, and planning for the next meeting at Port Revel in May 2010, when the consortium would also have the chance to experience the available facilities firsthand, and witness the completion of model tests carried out by Port Revel. The AZIPILOT project has been underway for 12 months now and some very interesting results are being uncovered. The consortium is on track to produce the first technical deliverables at Month 18 (May 2010), containing interesting and relevant insights into the operation of Azimuthing devices at port and at sea, and the training and human factors implication of such. The consortium met for the final time in Year One at STC's training centre in Rotterdam, and amongst other activities, took part in a very informative tour of the HRP premises nearby. The AZIPILOT project held its Month 9 meeting in Gothenburg, Sweden on the 7th, 8th and 9th of September 2009. The meeting was hosted by project partner SSPA and included an excellent tour of the SSPA testing facilities, as well as working inter-island ferries, a small oil tanker, and the Lighthouse simulators at Chalmers University. The meeting considered progress so far and discussion regarding the content and procedure for the project surveys continued. All work packages also took the opportunity to present their work carried out so far, and their plans for the next 6 months progress. 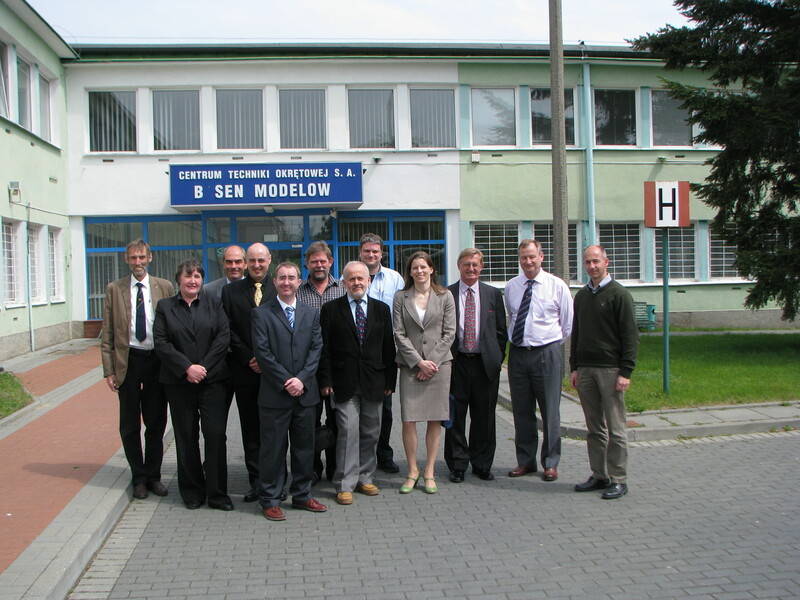 The AZIPILOT project held its Month 6 meeting in Gdansk and Ilawa, Poland on the 18th and 19th of May 2009. The meeting was hosted by project partners CTO and SRTC and included an excellent tour of the CTO Model basin facilities and an opportunity to witness open water testing at CTO's lake base on the first day. On the second day, partners had the opportunity to witness firsthand the challenges of operating azimuth-controlled ships onboard SRTC's manned models at their Ilawa lake base. The AZIPILOT project held its Month 3 meeting in Lyngby, Denmark on the 16th and 17th of February 2009. The project was hosted by the project partner FORCE Technology. The meeting included an excellent tour of the host facilities; which promoted much innovative discussion between the project partners. The meeting considered progress so far and discussion were made regarding the content and procedure for the project surveys; which form a significant part of the current work. In addition, some initial results were presented which enabled decision making as to the future direction of the work. The AZIPILOT project set-its-sails on the 1st of November 2008. Activities started with the first meeting; a two day kick-off meeting held at Newcastle University, UK. In total, 24 representatives from the partner companies attended the meeting to discus, plan and implement the project activities. A strong and positive enthusiasm was expressed by all partners; fired further by the varied and informative cross-disciplinary discussions. The meeting served to set the groundwork for the months ahead and the initial project activities. In addition, agreement was made to seek-out key industry stake-holders and subject-experts, with the intention of offering participation through the formations of an Advisory Committee. The activities culminated with the decision to hold the next meeting in Denmark, next February.